Would be nice if the Affinity Photo would allow to produce the wanted print marginals to wanted print size. What is required is first user selects New Document that is set to the final print size. And all those are not going to come over the chosen final print size in New Document, but would enlarge the created document size with additional empty space and with correct marginal lines as chosen to overlay. So if user selects a final print size to be A3 in "New Document" then the document size is exactly the A3. If user selects then to add a margins, the document is enlarged by the amount of chosen bleed margin size like +6mm on each side. 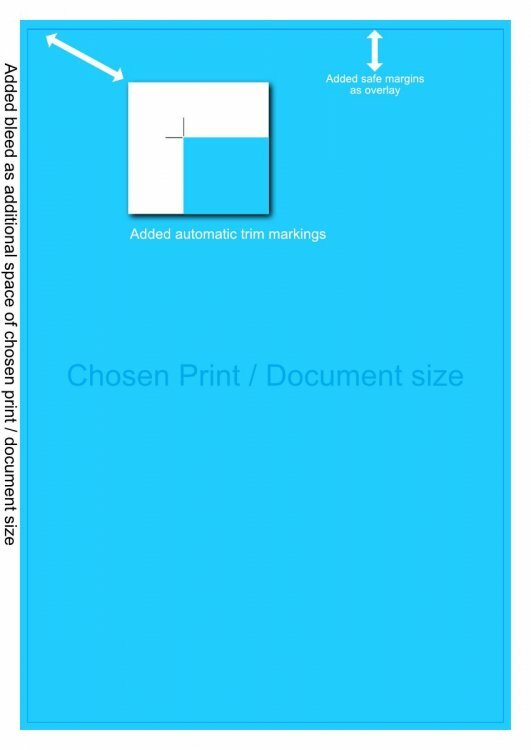 If the user then choose to add trim margin visible, then that margin gets overlaid the document as that is the final print size (the chosen A3). And then if user choose to add safe margin, it will be the only margin that is inside the final print just showing the final safe side. This would allow super much easier producing the print out to offset printing when one doesn't need to care at all about anything else than just slap the file inside the document and check it is fitted just outside of the trim (final) and then get out the file that has correct bleed and trim markings overlaid outside without creating those by user himself. The other additional nice additions would be to allow to resize the layer in pixels as in any other way as the document is possible to be just by going Layer > Resize Layer. So if a photographer needs to prepare files for off-set printing, it would be super easy to just produce the files from photographs. Resize image to overlap the trim margin as wanted.